Deepika Padukone and Ranveer Singh have finally released pictures from their two-day wedding in Italy. 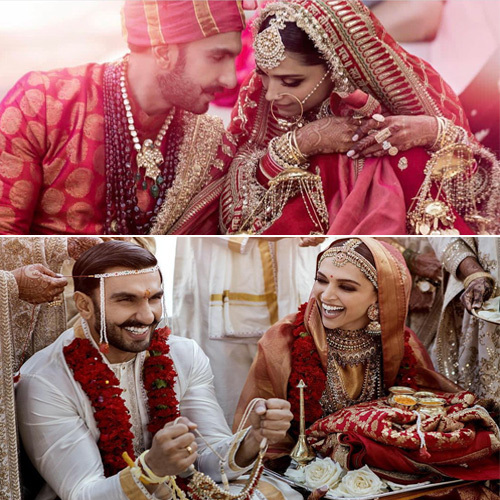 Two photos, one each from the couple's two ceremonies, were posted on Deepika and Ranveer's Instagram accounts at exactly the same time on Thursday evening. The posts, unsurprisingly, instantly shot towards viralness, racking up likes and comments. Looking resplendent in a Sabyasachi bridal lehenga and jewellery, Deepika made for the most beautiful bride during the second rituals held on November 15. But what caught the attention of the world besides the Sanskrit quote on her dupatta, was Deepika's huge solitaire which could be seen standing out of the many rings the actor wore for her nuptials. Looking gorgeous on her henna-laden hands, the rectangle solitaire set in platinum has got the town talking for its mere size.